Joomla SAML 2.0 IDP allows users residing in your Joomla site to login to your SAML 2.0 compliant Service Provider. Joomla as IdP SAML SSO Plugin acts as a SAML 2.0 Identity Provider which can be configured to establish the trust between the plugin and various SAML 2.0 supported Service Providers to securely authenticate the user using the Joomla site. Login to any SAML 2.0 compliant Service Provider using your Joomla site. Easily configure the Identity Provider by providing just the Issuer, ACS URL and NameID format. Make user login more secure by signing and encrypting response to Service Provider. Easily integrate the login link from your Joomla site using link for IdP initiated SSO. Just add it in a desirable place in your site. Use the Attribute Mapping feature to map Joomla user profile attributes to your SP attributes. Use the Role Restriction feature to allow only selected user groups to log in to your Service Provider. The Relay Restriction Feature allows selected user groups to be redirected to a Custom URL. Use the Role Mapping feature to send roles assigned to users from your Joomla site to your Service Provider. Supports multiple Service Providers from the same Joomla instance. Step 1: Installing the plugin. You can download the plugin zip file from the download link given above. 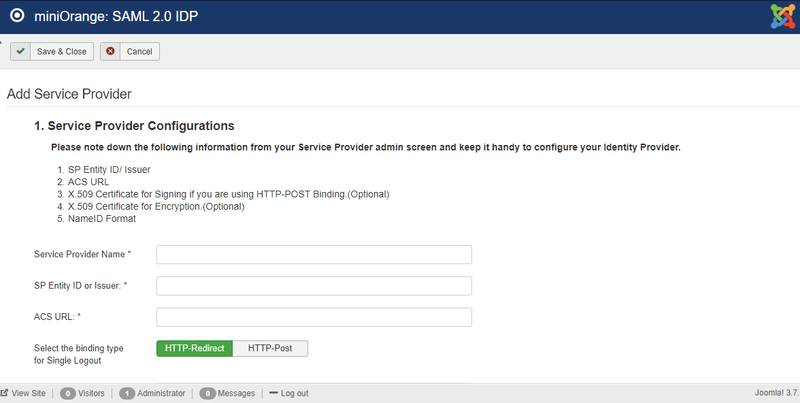 Login as administrator in Joomla. Go to Extensions > Manage > Install. Choose miniOrange Joomla plugin IDP file to install. Step 2: Register/Login into miniOrange account. In Account Setup tab, under 'Register with miniOrange', enter your email id and password to create an account. If an account already exists, you will be asked to login into your account. Step 3: Configuring the plugin. In the Joomla admin interface, go to Extensions > Manage > Manage. Here you can enable and disable Joomla plugins and edit plugin details and options. It is also useful for quickly enabling or disabling multiple plugins at the same time. Search for miniorange in plugins. Enable all the extensions of the plugin. Go to Components > miniOrange Joomla IDP. In the Identity Provider tab, collect the information given there to configure your Service Provider. In the Attribute/Role Mapping, select the NameId attribute. Click on the Save button on the top left. If you don't find what you are looking for, please contact us at info@miniorange.com or call us at +1 978 658 9387 to find an answer to your question about Joomla IDP.